ILYSMM | What Does ILYSMM Mean? 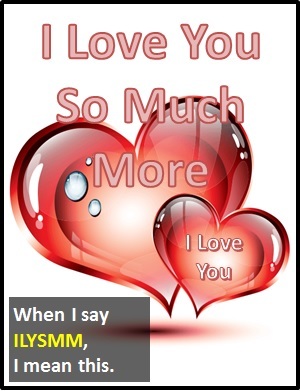 ILYSMM means "I Love You So Much More". ILYSMM is a response to someone declaring their love for you. It is often said with an element of competitiveness (i.e., the responder then expects the first person to say ILYSMM too, and so it escalates). Said in other words, ILYSMM means "I love you more than you love me". "I love you so much more" (ILYSMM) means I love you more than you love me. Person A: You are the most wonderful person on this planet. I love you. Person B: Ditto but ILYSMM. Person A: I love you to the moon and back. Person B: ILYSMM. In fact, to the sun and back. ILYSMM is a declarative sentence (i.e., a statement). In other words, it is not used as a part of speech in a wider sentence. As it is pronounced using its individual letters (i.e., "Aye El Wye Ess Em Em"), ILYSMM is classified as an initialism abbreviation. Initialisms are different to acronyms, which are spoken like words.